American Steve Welch will come home with gold in doubles and a bronze in singles competition in Guadalajara. GUADALAJARA, Mexico - The United States Wheelchair Tennis Team finished competition at the 2011 Parapan American Games on November 18th, 2011. There were two medals on the line for the Americans including Bronze in Men’s Singles and Gold in Women’s Doubles. Stephen Welch played Robinson Mendez of Chile for the bronze medal in Men’s Singles. Welch came out strong in the first set, breezing through to a score of 6-0. Welch dominated the entire set forcing Mendez into several unforced errors and delivering punishing winners. Mendez was not through however and jumped to an early 3-1 lead in the second set. Welch, unfazed by the Mexican crowd chanting: "Chile... Chile... Chile...", set forth into a workman like performance renewing his dominance over Mendez, winning the second set 6-3 to win the bronze medal. 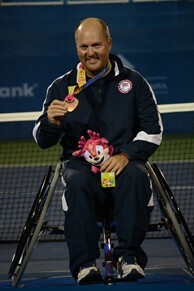 This was Welch’s second medal of the Parapan American Games having previously won the gold medal in Men’s Doubles with Jon Rydberg. The final match for the U.S. Wheelchair Tennis Team was the gold medal women’s doubles match. Mackenzie Soldan and Emmy Kaiser of the United States felt the pressure to remain unbeaten in the Parapan American Games in singles and doubles. Facing a strong duo from Colombia, Johanna Maritinez and Angelica Bernal, on center court was no easy feat. The first set was a test of wills with long points finished by an untouched Kaiser forehand up the middle or a Soldan drop volley that dazzled the crowd. However, the Colombians fought back with incredible consistency and forehand winners of their own. By the end, the US duo outlasted the Colombians 6-3. The tone was set in the first game of the second set where the US duo won a critical game and never looked back. Simply said, Soldan and Kaiser dominated the second set winning 6-0. This was Soldan’s second gold of the Games, having previously won the Women’s Singles Event and Kaiser’s second medal having won a silver medal in the Women’s singles event. As the lights were doused the final time at the Parapan American Games Tennis Venue in Guadalajara, Mexico the United States Wheelchair Tennis Team left a lasting imprint. The US flag was raised in all four medal ceremonies, three of which saw the US flag raised the highest as the Star Spangled Banner was played with a US athlete wearing gold. Yet perhaps the biggest imprint was the friendships made with athletes from other countries and the local team in Guadalajara.